The Schantz Organ Company began reinstalling the restored E.M. Skinner Organ in early December 2007 at Rockefeller Memorial Chapel. Workers will tune its Romantic tone over the next few months in time for an early-summer concert, which also will feature the rebuilt Laura Spelman Rockefeller Carillon. You can see it, but you just can’t hear it yet. The beloved E.M. Skinner Organ is back in place at Rockefeller Memorial Chapel, although it will be months before the public can experience its bigger sound. The Schantz Organ Company is completing the reinstallation of the 80-year-old gem, which has grown from 7,700 pipes to roughly 8,500 in the $2.1 million restoration project. It will spend the next few months perfecting the organ’s Romantic tone, in the hopes of an early-summer concert that also will showcase the rebuilt carillon. In early December 2007, workers began assembling organ pieces that filled six semi-trailers. Starting in the rear gallery, they then moved to the chancel, featuring its 32-foot wood pipes that required six men to move. The wind lines and blower, which feed air into the system, also were revamped. The greatest challenge—and biggest visual change to visitors—lies in the chancel organ. Previously speaking sideways into the chancel, much of its sound was muffled. When the organ was disassembled, workers removed a large area of brick and plaster filler just below the carillon tower. They then constructed a “tone arch,” framed with limestone, which will allow sound to travel directly into the chapel. The organ was disassembled in July 2006 and shipped to Schantz’s plant in Orville, Ohio. 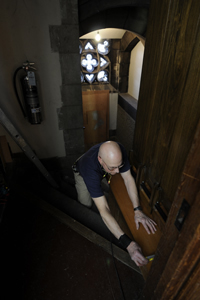 Each pipe was examined for damage—water leaks had long plagued the chapel—and open seams were sealed. Thousands of new leather gaskets and pouches were installed, broken pieces were replaced and new mechanical fasteners were added. Computerized routers created duplicate wooden pipes out of poplar, while replacement metal pipes were carefully hand-crafted. Some pipes were simply missing. 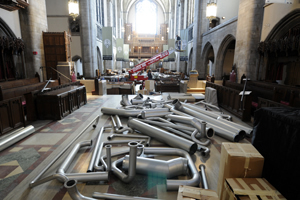 The entire choir division had to be rebuilt, said job foreman Robert Baumgartner, because that set of pipes had been “cannibalized” during the University’s 1970s Baroque revamp of the organ. 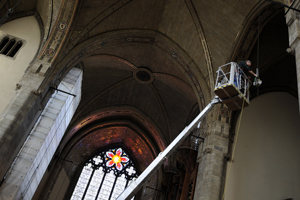 The balcony will house the centerpiece of the renovation—the Randel State Trumpet, named for Don Randel, President Emeritus, who received a $1.6 million birthday gift from trustees in December 2005 to rebuild the organ. The 61 copper pipes of the trumpet will flare out over the crowd. New solid-state electronics will link the chancel and great organs with the push of a button. A new gallery console has been installed, and the massive chancel console has been refurbished, replacing the rented Rodger’s 957 electronic model that has served the chapel since the grand organ was silenced in early 2001. 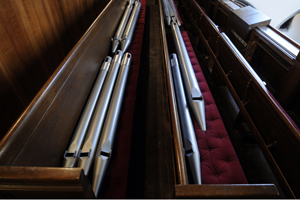 Once the pieces are in place, a two-man team from Schantz will begin “voicing” the organ, a process that ensures each pipe has the right tone and speech. 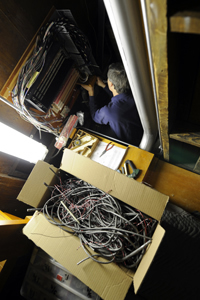 For five to six days a week, for the next eight to 10 weeks, the crew will painstakingly check each pipe. The organ also will be regulated for volume before it is finally tuned. Not to be forgotten is the restoration of the Laura Spelman Rockefeller Carillon. 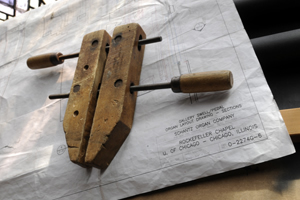 According to Lorraine Brochu, Assistant to the Dean for External Affairs for Rockefeller Memorial Chapel, 46 of the bells were taken out in September and shipped to the Royal Eijsbouts foundry in the Netherlands for tuning and reconditioning. It is the chapel’s first major renovation since the late 1980s, said Brochu. She said a $20 million “envelope project” has included repairs to windows, masonry, downspouts and drainage. Electrical and lighting upgrades also have been made. The organ and carillon are set to officially debut during Alumni Reunion Weekend, with a Saturday, June 7 public concert at 4:30 p.m.